Today May 20th 2010 is the birthday of Israel “IZ” Kamakawiwo’ole. He would have been 51 years old today. Last year, for his 50th Birthday we asked the Fans of his Facebook Page to choose a song for a slideshow of family photos we have from his wife Marlene. This is the slideshow set to the fan selected song “White Sandy Beach” from his album Facing Future. There are 13 comments on Happy Birthday Israel. 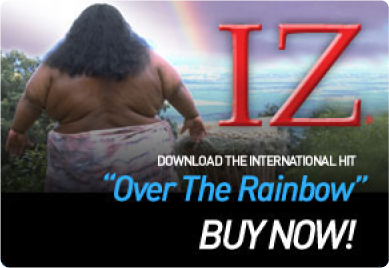 Please know the happiness and love that IZ still brings to many of us around the world. Truly a voice from above still carries us through. God bless you and yours and thank you for continuing to share his talents. Happy Birthday, IZ!!! You were such a joy while here on earth…May You Rest In Peace With The Rainbows. Happy Birthday, IZ!!! I wish I could have heard your beautiful voice in person. I love your voice IZ! I wish I could have heard you in person. God needed another Angel with a beautiful voice! Happy Birthday, Iz! We’re all better people for having heard your music. Blessings and love from Ogden, Utah USA. RIP IZ, you will never EVER be forgotten. We all love you! “Can You Feel the Love” I think Israel can feel the Love. We will not forget, ever.